When we were checking in to our hotel room, the desk clerk asked if we were there for the "cherry thing-a-ling." I said that we were not, because it sounded kind of spurious. "Our annual Cherry Thing-a-Lings are a once a year a treat. It falls during President's Day Weekend in February. This is the only Sunday out of the year we are open. We have extended hours and triple our staff to accommodate the amount we produce during this 4 day weekend." The total number served for 2018 was 116,748. "WHAT IS A CHERRY THING-A-LING? 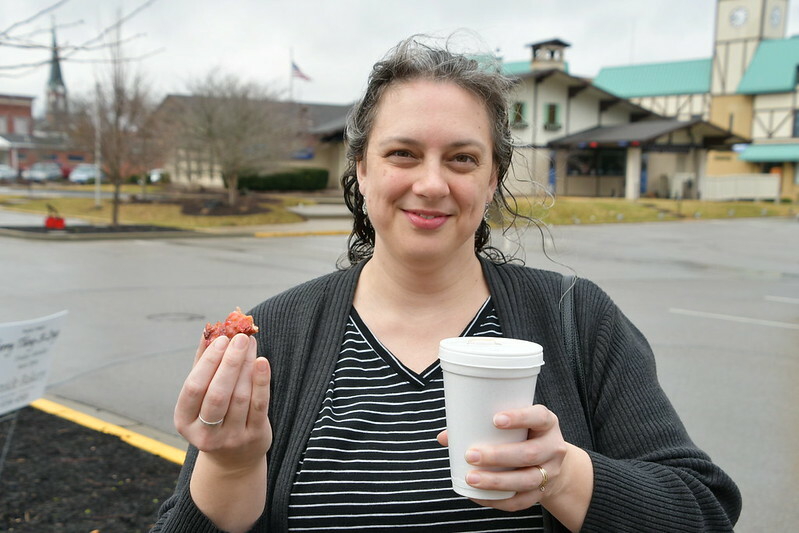 : A Cherry Thing-a-ling is a fritter type donut that has cherries in it, instead of the typical, Apple or Blueberry (which we also make). It is fried to perfection and then topped off with a cherry glaze! Most of the time they are still warm during our 4 day weekend, and that's what truly makes them special! Nothing better than a warm donut!! (yes I'm spoiled, I can't help it) If you have some that aren't warm, we suggest a quick pop in the microwave to soften and make them ooey gooey delicious! We hope you like them as much as we do!" 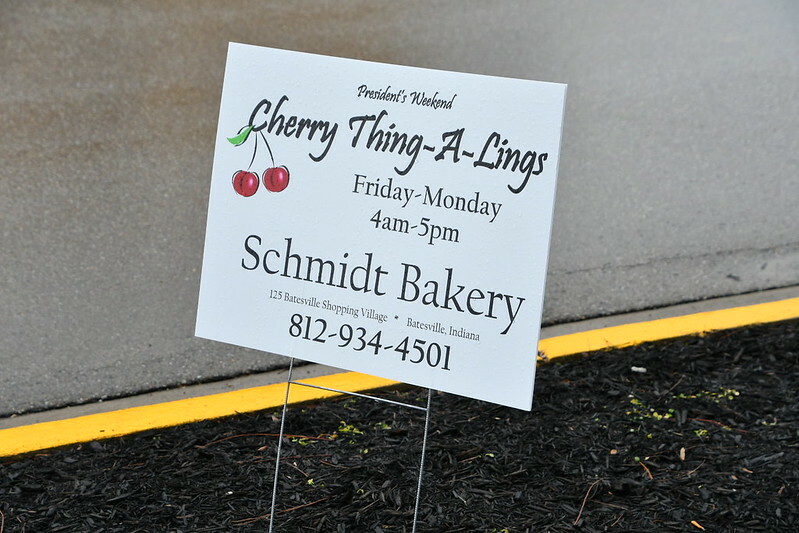 Signs like this were all around Batesville to advertise the availability of this year's Cherry Thing-A-Lings. 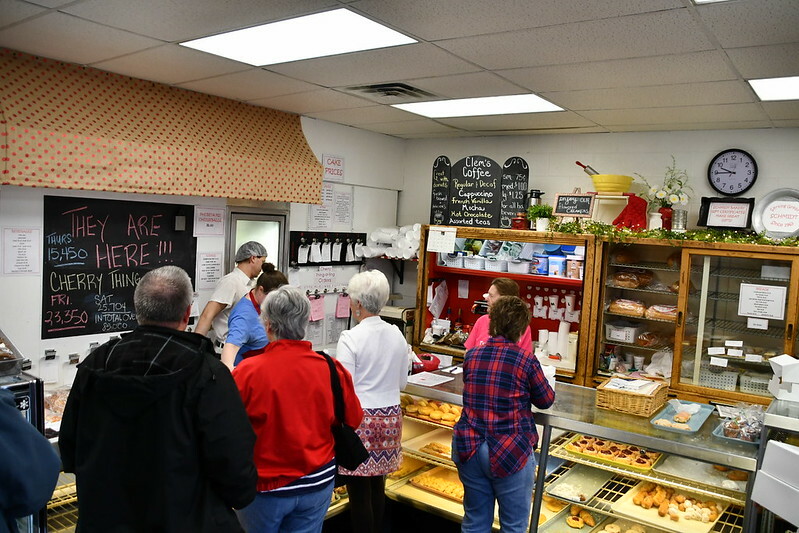 The line of customers at Schmidt Bakery ran out of the door. We were there early, so it was shorter than usual. You can see one of the wooden cherry decorations that were placed all around town for the weekend. 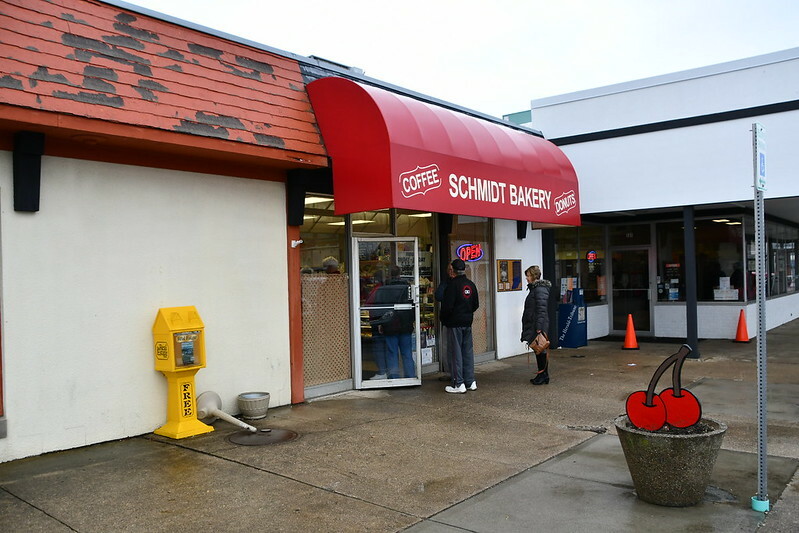 The interior of Schmidt Bakery was somewhat small, and although it mentioned that the Cherry Thing-A-Lings were here, there was no description for what one was, and no mention of their cost. 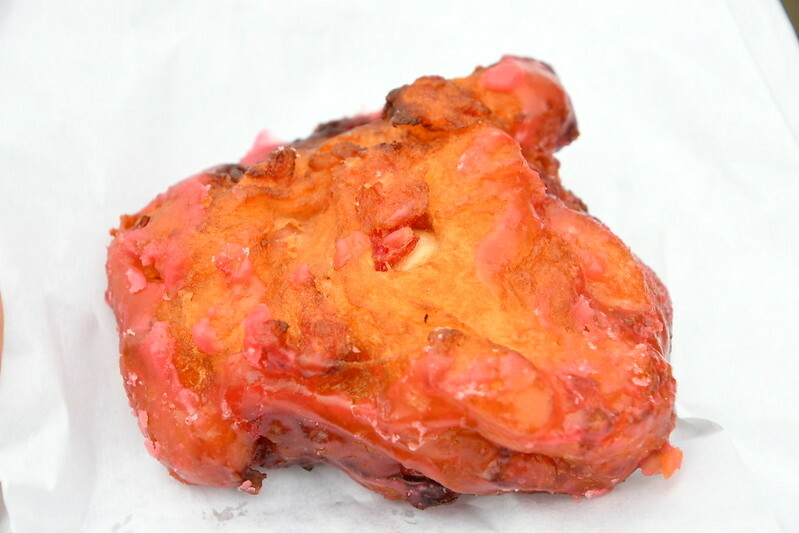 While this photo looks more like cherry-smeared fried chicken, the Cherry Thing-A-Ling is actually a deep fried cherry-filled fritter. Katherine got some coffee to go with her Cherry Thing-A-Ling, and we both heartily approved of them.